A unique level of commitment has led you here… a calling, some might say. As an experienced professional, you possess an extensive range of knowledge, skills and capabilities. This expertise, combined with your dedication to always offering clients your best, is what makes you such a valuable asset to others. But your services – encompassing the whole of your training and life experience – can be leveraged even further. When you add a coaching credential to your professional toolkit, you gain fresh, innovative and holistic ways to work with those you’ve dedicated your life to. A coaching credential builds upon your years of academic and work experience without costly, time-consuming post-degree trainings. It is one of the fastest ways to broaden your services and appeal to a new client base. Break through any limitations and solidify your reputation with a research-driven strategy that capitalizes on your existing training and background experience. Pivot into your full potential – online and in less than one week! – with our Board Certified Coach Training Programs (BCC). The BCC is the only coaching credential that incorporates your verified education, professional training and work experience. Offered in conjunction with the Center for Credentialing and Education (CCE), an affiliate of the National Board for Certified Counselors (NBCC) – our Board Certified Credential (BCC) Certifications are the fastest way to improve the profile, quality and effectiveness of your professional services. 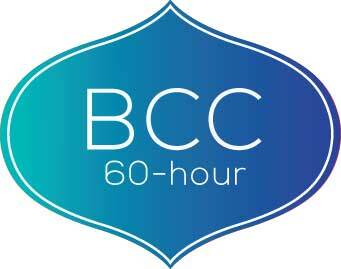 If you are a therapist, psychologist, doctor, dentist, counselor or offer personalized services in which you help or heal others, a BCC credential can further solidify and expand your reputation. It is the preferred method for those with advanced degrees and training to add supplementary services, broaden their client base, and increase the perceived value of their practice. Whether you use your coach training to build in-person relationships or develop new ways to connect with clients, it’s the easiest way to operate within your chosen specialty while setting yourself apart from other practitioners. That’s because the Board Certified Credential (BCC) builds on your personal expertise, adding proven methodologies taken from a range of scientific fields. This results in greater outcomes for your clients. Coach training greatly enhances the impact you have on the lives of your clients. It also increases positive word-of-mouth about you and your services. These self-innovative tools have strong appeal to the growing number of individuals who seek a more collaborative, holistic connection with their personal care providers. “Coaching has changed what I do so completely, it’s hard to even remember how I used to practice. I see myself as a healer now, capable of reaching out and helping somebody make a true difference in their life, as opposed to simply making their teeth look nicer. Step 1: Coach Training Program – Depending on your level of education and experience, you’ll attend either our 30- or 60-hour BCC coach training program. Step 2: Coaching Experience Hours – To earn your credential you must coach others outside the coach training program. But if you’re like other BCC candidates, you may not have time to find these clients on your own. So at Coach Training World, we’ve developed a network through which we can help you find the clients you’ll need to satisfy this requirement. Step 4: BCC Exam (BCCE) – The exam is an independent verification of your coaching knowledge and proficiency. It is administered via computer-based testing at centers throughout the world. But don’t worry: we’re here to help you prep for this final stage of your certification. Why earn a advanced degrees. This program takes into account your current coach-related education and training to fast track you through the credentialing process. Coaching has been shown to increase the success of its clients and foster more successful self-management through markedly improved engagement. Unlike the standard approach of many personal services in which practitioners “tell” their clients what to do, these improved communication skills “invite” active participation to create the best plan for the client’s future. The CCE now offers four specialty designations. This voluntary add-on enables you to further market your services to a new or extended client base through independently verified professional credentials and endorsements. It’s another feather in your cap for a business card, website and social media accounts. Board Certified Coaches can obtain liability insurance covering up to $1,000,000 per claim and $3,000,000 total through Lockton Risk Services, Inc. Still wondering if Coach Training World and Whole Person Coaching is right for you?